The Power of Kangwon Province is the second film of Korean director Hong Sang-soo, and his first film as both writer-director. Like his first film, The Day a Pig Fell Into The Well, The Power of Kangwon Province contains a complex storytelling style that relies a great deal on the viewer's ability to recall earlier scenes and make connection. However, the narrative is simplified to some extent. Hong's first film was split into four parts with four main characters. Here, there are two halves with two leads. This, combined with images that are have more depth and have a more picturesque quality, makes The Power of Kangwon Province a slightly more accessible work. In an interview, Hong described the film's structure as follows: "A woman and a man, who recently broke up, travel separately to a same location by coincidence. One person trails the trace of the other person. It is about two individuals missing their partners and they ae connected by the structure of the film. (2-1)+(2-1)=2 structure." (54) This structure does not reveal itself, however, until the second half, which makes the audience have to retrace the original story and the meaning we felt it had. In one way, this makes the film work similarly to many mainstream movies in which the plot gradually enfolds and we can make sense of earlier actions that seemed ambiguous. But at the same time, Hong is calling on a far greater cognitive ability from the viewer than most films, almost insisting that the viewer re-examine the film a second time. Stylistically, Hong opts for more long takes and often simplifies the number of angles he shoots from. Earlier in the film, especially during scenes in nature, Hong opts for a shorter focal length and shoots many depth of field compositions. 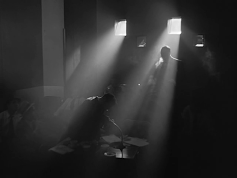 But as the film nears its conclusion, Hong flattens his images more in the style of Asian minimalism (for example, the still above in which the two main characters come together near the conclusion). I am looking forward to viewing Hong's third film, The Virgin Stripped Bare by Her Bachelors (2000), which I also just purchased here on DVD, in which Hong takes on black and white cinematography for the first time.